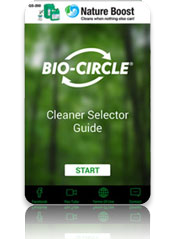 The Bio-Circle Cleaner Selector app is designed to help workers in MRO environments quickly and easily select the right product for the application at hand. Select the contaminant you are cleaning, the parent material, size of the part or surface and preferred cleaning method and the app will generate a product recommendation. ​Our mission is to contribute to our customer's success by helping them work better. The day of working with toxic solvents is over - welcome to a new generation of industrial cleaning! Forward-looking companies are choosing Bio-Circle because of the product line's proven ability to cut through the harshest contaminants, while ensuring the health and safety of the worker and the sustainability of the environment.